Ewan started his PhD at the University of Calgary in September of 2010 after completing his undergraduate degree at the University of Glasgow, graduating in 2010 with a B.Sc. Honours in Geology. During his undergraduate degree he worked as a research assistant, curating and photographing a large thin section collection in the Hunterian Museum, Glasgow. This motivated him to undertake an undergraduate thesis. The project focused on the origin of micro-zircon, what triggers new zircon growth and how commonly it forms under lower temperature conditions. With a strong background in petrography and desire to continue with research in this field, he decided to continue his education with graduate studies. In September of 2010, he started a field based exploration and petrography PhD at the University of Calgary, under the supervision of Dr David Pattison. 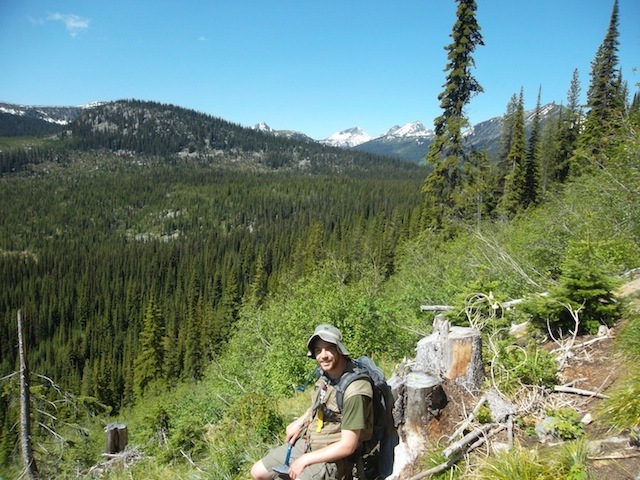 His PhD research is primarily focusing on the tectonothermal history of the southern Kootenay Arc and Purcell Anticlinorium, in southeastern British Columbia and is funded by Geoscience BC. Project: Metamorphic and structural reinterpretation of the Southern Kootenay Arc and Purcell Anticlinorium, southeastern British Columbia. The aim of this project is to elucidate the tectonothermal history of a region of southeastern British Columbia between Nelson, Salmo, Creston and the Canada–United States border that straddles the tectonic interface between the pericratonic metasedimentary and volcanic rocks of Quesnellia to the west, and distal marginal rocks of the ancestral North American margin to the east. This tectonic juxtaposition, and subsequent episodes of magmatism, metamorphism and deformation, occurred during Cordilleran orogenesis in a time interval spanning the Jurassic to Eocene. The primary structural-tectonic domains in the area are the Purcell Anticlinorium, Kootenay Arc and northernmost extension of the Priest River Complex. The nature of the interface between these three domains is complex, with spatial variations in the grade of metamorphism and intensity of deformation. This geological diversity has resulted in a particularly wide variety of ore deposits, many of which are deformed and metamorphosed. Field-mapping techniques combined with whole rock geochemistry, detailed petrography and microstructural analysis, microprobe chemical analysis and phase equilibrium modeling (Theriak-Domino, THERMOCALC) are being applied in conjunction with U-Pb zircon and monazite geochronology and 40Ar/39Ar thermochronology to define a P-T-D-t path, in order to determine the metamorphic and structural history. This study is developing a new tectonothermal model for the region that helps constrain the spatial controls, genesis and timing of mineral deposition in an important, mineral rich region of southeastern British Columbia, with implications for improved exploration strategies.